Derin J. Atwood, who has been telling stories all her life, first to her younger brothers and then to her own children. She now writes novels and short stories. She is attempting to get her first novel, The Caves of Kirym, published, for which she has written the sequel and is presently writing the third in the series. Some of Derin’s short stories will appear in New Zealand publications in the coming year. You can find Derin’s work online at 52|250. Derin lives in Whangarei with an adoring husband and a small green car called Kermit. 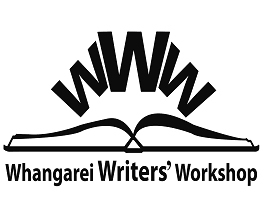 Rosalie Carey MNZM; FTCL; LGSM, who is the author of nine books in a variety of genre published by Nelson Price Milburn, Mallinson Rendell, Birch Tree Books, University of Otago Press, Steele Roberts, Earl of Seacliff Art Workshop, Inder Publications and Whangarei Writers’ Workshop. She has also had articles in the New Zealand Listener, School Publications, Spin and other publications. Until very recently has also been a teacher of oral communication and drama, professional actor, events organiser, public speaker and performance poet. Tony Clemow, who is a descendant of the renowned Cornish poet, Jack Clemow. Verse comes easily to him. He prefers the satirical genre and specialises in lampooning the foibles of those in power and the vagaries of the institutions which control our lives. His satire has appeared in several newspapers under the pseudonyms of News Muse, Clemihew and Anthony Addverse. He ran a regular column in The Sunday Star Times 2004-05. He founded and chairs The Deaf Poets’ Society to cater for those who are deaf to conventional wisdom as to what poetry should or should not be. Michelle Elvy, who lives and writes on a 43′ sailboat. Her professional lives have included teacher, historian, translator, editor, and chief wrangler at a software consulting company. She has published stories about children, food, faraway places, motorcycling, dreaming big, and the kindness of strangers. Her nonfiction articles have appeared in Cruising World, Blue Water Sailing, and Latitudes and Attitudes, and her fiction is online at Metazen, Words With JAM, and Six Sentences, and Fictonaut. You can find Michelle writing at Glow Worm, listening at VOICES, flashing at 52|250 or sailing on Momo. Joy Elwel, who writes lots of stories and poems for children which she illustrates beautifully. She has produced many illustrations for the group. Anna Groenestein, who is treasurer for the Workshop and writes articles and stories. Narine Groome, who is a dairy farmer’s wife at Mamaranui and was primary school teacher for many years. She now lives in Whangarei on a small block. In 2009, Penguin published her children’s picture book, Wheelbarrow Wilbur, with illustrator, Bevan Fidler, also from Whangarei. This enabled Narine to realise a long-held dream. She also is interested in writing short fiction for adults and has been placed in competitions for this genre. Barbara-Lucy Hosken, convenor of the Workshop and the only remaining Founder Member. She taught Creative Writing in Northcote and Glenfield and organised regular readings of students’ work. Northshore Creative Writers’ Group developed from her classes. She was invited to tutor International Writers’ Workshop in Auckland which she did for several years. She has four books to her credit and was a staff writer for NZ Fisherman. You can find Barbara-Lucy’s work online at 52|50. Barry Newbold, a retired dentist. He realised after some years in practice that his profession was not allowed to have any sense of humour. In a vain attempt to rectify this anomaly he turned to writing and was for some years a columnist for several newspapers and magazines. Alas, his protests fell on deaf ears (well, mostly). To reach other ears he is now working on a book titled Serious Humour. Lyall Phillip, born in Temuka, educated at Te Kuiti High School, and trained as a carpenter. He saw active service during the Korean War, 1951-4. His main employment in the construction industry was as a Safety Administrator. In retirement he became interested in writing and enrolled in the Workshop. He won the Bream Bay Budgeter Competition in 2006, was highly commended in the Waipu Poetry Competition, has had several poems published in the RSA Review, and recently published a novel A Trucker’s Love. Ian Walter Reid, retired cabinet maker and French polisher, who has been a wood sculptor for 43 years and writer for 21. Now living in Kamo he joined the Workshop which he has never regretted. He now feels more confident in writing and looks forward to the meetings. He writes to leave a legacy of his life and times for his family. Gloria Rockel, who did well from an early age with essays. She has had stories and poems published in magazines and booklets. She was co-founder of the Whangaparoa Hibiscus Coast Writers’ Club which still thrives and is a member of Whangarei Deaf Poets’ Society and the Workshop, where fellow members offer help and encouragement. She recently published Not Just Tea and Scones, a book of favourite recipes passed in over many years by members of Whakapara Women’s Institute. She also writes a monthly report for the Hikurangi Bulletin. Colin Toomer, drummer/percussionist and a very active supporter of local arts. He currently presents Colin’s Mates for Channel North Community TV Station. Helena Toren, secretary of the Workshop, who has done office work, waitressing, and industrial sewing among other things. She writes short stories and the occasional poem.